Click the button below to add the Copper Bathtub 'Clawfoot' to your wish list. 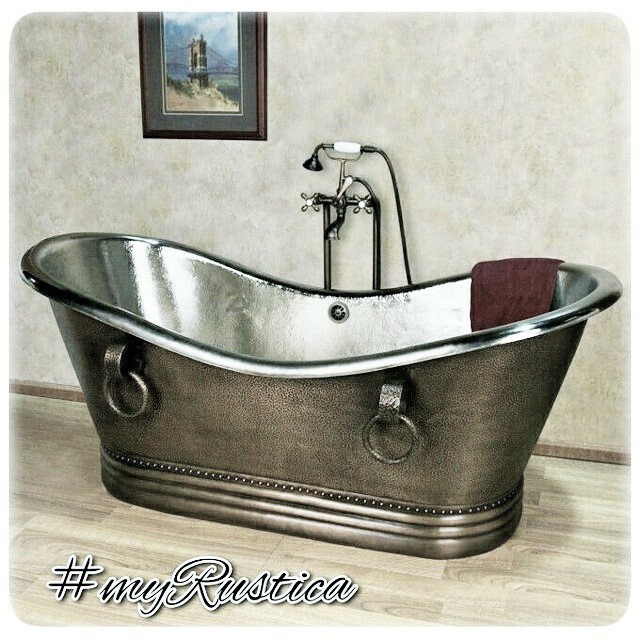 Rustica clawfoot copper bathtub is one of the most elegant tubs on the market. Presented on the detail page bathtub version was handcrafted in oxidized copper which turns green in the process. The surface is protected with varnish so the process is not advancing any further and bathtub copper finishing is more less permanent. As any freestanding bathtub for sale on our site it can be hammered in sixteen or fourteen gauge metal. We can add an over flow system connecting both drains and preventing bathroom flooding. You have multiple options when this clawfoot copper bathtub size is concerned. Furthermore, you can customize the tub with one of many finishing options. Expect delivery in the US in about four weeks from the payment date. We ship from Mexico.